Tuesday, March 10 8-10 pm. If you have ever felt chained to a desk, or simply long for more freedom in your life, you’ll want to meet Steve Roberts. In 1983 he sold his suburban Ohio home and moved himself and his free-lance writing career to a 225-pound computerized recumbent bicycle. 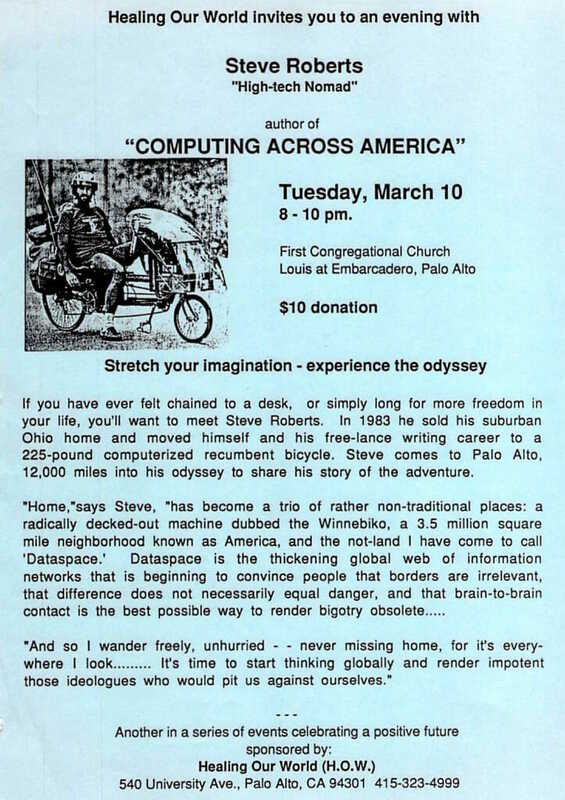 Steve comes to Palo Alto, 12,000 miles into his odyssey to share his story of the adventure. “Home,”says Steve, “has become a trio of rather non-traditional places: a radically decked-out machine dubbed the Winnebiko, a 3.5 million square mile neighborhood known as America, and the not-land I have come to call ‘Dataspace.’ Dataspace is the thickening global web of information networks that is beginning to convince people that borders are irrelevant, that difference does not necessarily equal danger, and that brain-to-brain contact is the best possible way to render bigotry obsolete.